Today giant cups of soda would have become illegal in New York. But at the last minute the ban was stopped by a judge. It’s not very far-fetched to believe that the soda industry had something to do with it. They have burned millions of dollars in advertising and lobbying against the proposal. They have also hired some of the highest-paid lawyers in the US to try to stop it. Why the panic? The soda industry makes most of their profits from “heavy users”, people drinking enormous amounts of soda every day (ruining their health). People who are addicted are profitable. And the soda industry wants no obstacles to get more people addicted. Now this latest decision will be appealed and the battle goes on. We know how it will end. We’ve seen this movie before, with the tobacco industry in a lead role. Once people smoked on the streets and in the restaurants of New York, but no more. Getting rid of insane soda cups is likely to do even more for people’s health. The question is just how long it will take. PS: I know libertarians are allergic to any regulation. Fair enough. Unfortunately this time they are Big Sugar’s little helpers. I resent the accusation that libertarians are Big Sugar's little helpers. The difference between libertarians and yourself is that you're cheering over giving Big Sugar a slap on the wrist, while libertarians have been demanding Big Sugar be sent to the guillotine. As a libertarian, I want to end government subsidy to corn growers and sugar producers. I want to end collusive tariffs on cane sugar put in place to benefit the producers of HFCS. I want to end government meddling in nutrition "guidelines" that recommend 6-11 servings of grain, and have put the stamp of approval on sugar as "safe". Let me put it in language you'll understand: This ban on sugary drinks is analogous to keeping someone's Type2 diabetes in check with insulin injections while ignoring the patient's sugar-rich diet that caused it in the first place. This ban on sugary drinks is analogous to beating down someone's cholesterol with statin drugs, while ignoring the fact that the patient's current diet of grains and vegetable oils is causing the inflammation which will lead to heart disease anyway. In both analogies, the patient has become beholden to a drug because the doctor's (well-intentioned but misinformed) advice is wrong. Libertarians want to stop this juggernaut at the source by removing power from the government to influence what we eat via subsidy, recommendation and health programs. It's government that has made most western nations fat and sick. Expecting government to fix it by giving them more power (as in the sugary drink ban) is naive. It's laughable if you believe this drink ban will be a blow to Big Sugar. People in NYC will just switch to the diet brands sold by the same companies, or buy their 750mL or 1L sports and soft drinks at the grocery, or convenience stores, because those aren't regulated. If you get your vente coffee every morning, you can still put 20 packets of sugar in it if you want, because adding sugar yourself isn't regulated either. Even so, drinks that are more than half milk (which the government considers "healthy") are also exempt, so huge sugary lattes will still be sold, as well as big cartons of chocolate and strawberry milk to school kids. What this ban amounts to is just another bit of red tape business will have to learn to (or spend money to) avoid, but in the end changes next to nothing. That's why I am libertarian: because I recognize the futility of allowing the government to fix its own mistakes by giving it more control over our lives. Someday you should really sit down and have a chat with Tom Naughton about the topic of government interference in our health and nutrition and how it applies to LCHF. It would be interesting to see him in one of your future interviews. Come on, now. If large cups of soda were banned, people would just buy small cups of soda along with a 2 liter bottle for refills. The government has no business deciding what people should eat and not eat (Remember when Denmark taxed butter because they decided it was unhealthy? You obviously didn't support that legislation.). Let people make their own choices. I understand the, and agree with no large sugar drinks, I do think the diet doc is a bit biased. If Bloomberg had, and may yet, come out with a red meat ban I do not think the blog would have been the same about our personal rights. Love the blog, but the large numbers, of recent viewing success, will be lost with hypocrisy. This is a victory for individuals. This is a defeat for those who believe in top-down, command-and-control decision making. Many years from now many people will wonder why they let other people make decisions that are best left to each individual to decide. And hey!!! Less concentration on the problems and more into solutions! Love the blog, but the large numbers, of recent viewing success, will be lost with hypocrisy. I know a lot of Paleo/Primal/Low-carb people in the US are libertarians or anarchists. If I was a hypocrite I'd pretend to agree, just to get more readers. However I think for health reasons we need a government of the people, by the people, for the people. Otherwise the big corporations win (not to mention the drug cartels) and they will continue to feed people propaganda and addictive junk food. "We are constantly bombarded with fizzy-drink commercials, relentlessly." Really? I haven't seen a commercial about fizzy-drinks in some twenty years. Oh, that was about the time I quit watching the idiot box. Did someone hold a gun to your head and make you watch these commercials? People are all about legislation as long as it bans what THEY don't like. Andreas, were you so happy to see butter banned on your side of the world for a while? I don't recall seeing that in your blog...maybe I missed it? If in your country you like having people tell you (or even more likely) like being able to tell others what they are allowed to eat or drink, that's fine, but that sort of legislation in the US makes Americans even more determined to get what's not allowed. It's been several years since I drank **any** fizzy drink, including club soda, but I'll be damned if the next time I go to New York I won't FIND a way to get more than 16 ounces of soft drink in a cup, so I can pour it down the drain. Brian writes "I resent the accusation that libertarians are Big Sugar's little helpers"
...presumably as a response to Doctor Andreas' post script "I know libertarians are allergic to any regulation. Fair enough. Unfortunately this time they are Big Sugar’s little helpers." Where is the "implication"? I see a clear statement "Fair enough. Unfortunately this time they are Big Sugar’s little helpers"
Now I realise that English may not be Doctor Andreas's first language but it is mine and it seems clear enough to me that he does not take issue with libertarians per se -- "Fair enough"
BUT he goes on to say that unfortunately, in this case he believes (as do I) that they have helped the cause of "Big Sugar" rather than the cause of public health. That is is no way an outright condemnation of libertarians but all too predictably I suppose, we get this immediate defensive mode of life and liberty or death! Go big or go home! There is no room for compromise! You can pry it out of my cold dead hands!. Gimme a break and look around you at the real world. You attitudes HAVE played right into the hands of the sugar companies; they literally poured millions of dollars into a campaign to stop this cap on serving sizes in restaurants NOT A BAN. ON SODA.. you can still drink as much freakin' soda as you want to... all the while carrying a semi-automatic weapon with an over-sized magazine of bullets probably... go USA! How does it feel to have been played by big business? Why would they have invested so much money if they did not suspect this initiative my Mayor Bloomberg would affect their sales? Doc, as long as you believe big corporations are the problem, you are part of the problem. Big corporations will sell us what we want to buy. If you want to change that, educate the consumer, don't regulate business. When the low-fat craze began (triggered by government food guidelines), many people blamed big corporations for selling us the fatty, buttery and salty foods which we found so addictive. Oh, the big corporations threw some "propaganda" out there that there was nothing wrong with their fatty food, because everyone resists change to some degree. But guess what? Very soon "low-fat" products began appearing on more and more shelves because businesses found out very quickly that those products SOLD. People began asking what their fast food was fried in,or what oil their popcorn at the movie theatre was popped in and restaurants switched to vegetable oils because that's what people wanted to buy. And all the while they were doing this, big corporations were putting out more "propaganda" that they were "doing their part for health" by taking the fat out of their products, when really, all they were doing was catering to a new market. Then came calorie counting. People wanted to know how many calories were in their food. Again people complained that the big corporations were "hiding" how many calories were in their products, thus tricking consumers into eating more calories than they should. Some corporations recognized that they sold more product if they labeled it. But this wasn't fast enough. So the government was only too happy to step in and mandate labeling on all food products. Those who demanded this regulation (just as those who demanded the large soda ban) lauded it as a new beginning in nutrition where people would know what they were eating and we would finally get obesity and diabetes under control. Fast forward two decades and we have to ask ourselves, what happened? Now we have the same situation, only regarding sugar. If you read up on the history of Big Sugar, you'll know that the evidence against them was already mounting in the 1970s, but they leveraged their connections with GOVERNMENT to wrestle official edicts from agencies such as the USDA and NIH that there was nothing wrong with sugar, or at least the evidence against it was inconclusive. With big brother government looking out for their health, the public was reassured that their cakes and cookies and sodas were just fine... until today. So here we are again, blaming the "big corporations" for tricking us into eating all that sugar, when the only thing they've been doing is selling us what we want to buy because a man from the government in a lab coat told us it was safe to eat. Instead of blaming big corporations and demanding they be regulated by government into producing only healthy foods (as so many well-meaning citizens and activists have disastrously done in the past), your goal should be CHANGING MINDS. And you are doing that through this blog and your work in Sweden. Gary Taubes is doing that through his articles in the media. Robert Lustig is doing that through his appearances in the media. All of us here are doing that by telling our friends, neighbours and coworkers that what you are saying is true, and to look you up. Change enough minds, and the corporations will change. All they want to do is sell things that people will buy. When people KNOW what real healthy food is, that is what they will want to buy. Big corporations will sell us what we want to buy. If you want to change that, educate the consumer, don't regulate business. If they are allowed to do this without any regulation (meaning they can spread any lie/half-truth they want) there will be so much false propaganda out there that it will be even harder to educate anyone. Do you think we would have the level of compliance with seat-belt use if there were not a penalty attached to not wearing one? How much fuss was there about civil liberties when they were first introduced? How many lives have they saved? Same with tobacco... "I'll smoke if I want to!" and yet it has now become far less socially acceptable and I daresay a great many lives have been saved and improved. Are these systems perfect? Of course not but as above if YOU don't agree with what YOUR government is doing them let them know... DO something about it rather than dismiss them as a bunch of money-grubbing dimwits and for gawd's sake stop just whining about it on blogs! Brian -- did you see this recent post by Dr Andreas? We do indeed vote every time we pass the supermarket checkout and of course I am big on taking personal responsibility for my actions but we are also very much outgunned in the information provided and in making sound choices by the ad agencies and "food" manipulators. How are we to rely on education when we can't be sure we can trust the "experts" to give is unbiased advice? We need legislation to protect the public from predatory practises like this. I see that kind of protection as a government role. Just like it took with big tobacco. Doc they are not allowed to lie about their product in advertising. The issue with their marketing begins with our government. If not for its involvement then you wouldn't be seeing adds touting healthy whole grains, or how sugar isn't unhealthy, just a calorie. They are able to make ridiculous claims ONLY because our government sided with the Lipid Hypothesis and the idea that a calorie is a calorie. If not for that government backing along with huge government subsidies to the corn and wheat industries those adds would be deemed dishonest. But you cannot take them to task when all they have to do is point to our government and say they say its true. This problem is a government creation, and you actually believe that short of an about face on their dietary guidance that any further regulation, or guidance will be anything but more failure? @FrankG: You see it as a reason for more regulation. I see it as a reason to get government out of meddling with (and catering to) corporations. It's a sad fact that most people today listen to the government when they want to find out what is healthy for them and what is bad for them. Government today is beholden to whomever has the most money, and you and I and Joe consumer don't have the money; corporations do. We need to get government out of the nutrition business, not give it more power to tell businesses what to sell. Big corporations will of course also TELL us what we want to buy. Congratulations. You have just reduced the consumer to a mindless sheep. I myself am an example of someone who was "addicted" to carbs and once I found out the truth, was able to change my ways. Are you saying that I'm just a smarter than average anomaly? That the majority of people are powerless to change their eating habits, or resist food advertising, so therefore we must intervene via government and help them? That most people are just too dumb to resist the siren song of sugar and starch in their diet? Doc, the solution isn't to regulate businesses into selling only what we believe is "healthy" right now, because history has shown that food companies are only too eager to latch upon the next tasty treat and use their connections in the government to prepare studies and experts to tell us it's good for us. The solution is to get government out of the nutrition business. It's to sever the corporate lobbyist connections in government. It's to stop the government from funding only studies which support its previously stated guidelines. The problem runs deep, Doc. It is pervasive in western society. Governments became big and stuck their fingers into everything, including food production and nutrition. Corporations, while wanting to make money, were only too eager to latch onto these fingers to give them an advantage over their competitors. So it's true that businesses have been corrupted, but only because government overreach allowed them to become that way. Blaming the corporations is the same as blaming a symptom instead of the real cause of the disease. I personally do not wish to have the government telling me what to eat. They seem to be getting it wrong all the time. I have lost 14kg, (89kg to 75kg) eating LCHF and have maintained my new weight for over a year and 1/2 with no hunger, lots of energy and over all feeling great. All this by eating exactly what the USA government says I should not, lots of very fatty meat. Look at what the Danish government did in 2011, the fat tax. “In October 2011, Denmark introduced a fat tax on butter, milk, cheese, pizza, meat, oil and processed food if the item contains more than 2.3% saturated fat.” It has since been scraped but that means I would had to have payed an extra tax of food which I believe is healthy for me. I would bet Bloomberg would also like to limit saturated fat as well. It is all just so (too predictably) reactionary "I don't want the government telling me what to eat!" -- well good for you... they are YOUR government so tell them that... they care about your votes, if nothing else. Meantime do you have any practical suggestions rather than just a knee-jerk reflex to knock over this small step in the right direction, that Mayor Bloomberg is trying? "But Mummy WHY can't I have a 20 oz soda cup?!?" "Well Johnny.. let's talk about the health implications of drinking that much sugar all at one sitting..."
This initiative has gotten *us* thinking and talking about these issues hasn't it? "This initiative has gotten *us* thinking and talking about these issues hasn't it?" Not really. We've already known and have been talking about the fact that high carbohydrate diets (not just sugar-laden) have been the root cause of our epidemics of obesity, diabetes and cancer. Banning sodas of a certain size will do absolutely *NOTHING*... except make those in power feel better because they're doing *SOMETHING*. This is the way the government works... they don't need results, they just need to make a huge show of doing something. We've already made practical suggestions. End government subsidies of corn... it's those subsidies that keep corn and HFCS dirt cheap and result in the soda companies selling bigger and bigger sizes that people can easily afford. Educate the public; start a campaign showing how excess sugar consumption leads to obesity, diabetes, heart disease and cancer. Those are the *ONLY* solutions that will garner results. If you believe that this will suddenly end high sugar consumption, you're very naive. "If you believe that this will suddenly end high sugar consumption, you're very naive." The widespread smoking bans we have nowadays did not start so extensively did they? Even today I see smokers who flout the laws but do you honestly think that education without legislation would have given us this much clean air to breathe??? Seat-belts are another example: they didn't start off with legislation from big nasty government but rather a car manufacturer (probably Volvo -- Sweden leading the way again!?!) started offering them as an option and then as standard equipment. Some folks laughed at the idea while others started to realise their safety benefit for themselves and their loved ones. Then road-safety advocates started collecting statistics and found that they actually made a noticeable difference to accidents and fatality rates. It was only much, much later that jurisdictions started legislating their use. Only AFTER the court of public opinion had already been convinced. At that time we had the same outcry of "I won't have the government tell me to wear a set-belt!" To this day, some dislike and distrust seat-belts but the statistics on this one are quite clear. Heck maybe Dale Earnhardt would still be alive today if he were not so pig-headed about wearing an HANS device, as is now mandated in many forms of motor-sport. Arguably seat-belts are also a matter of personal choice and individual responsibility but tell that to someone who has had another driver come flying out of one car into another during an head-on collision, or to the emergency crews who risk life and limb to rescue folks (or just to clean up the mess) who might have walked away unscathed if properly belted-up. Bringing back some common sense to soda serving sizes in restaurants COULD be such a small step, which starts the ball rolling towards getting the big solution which we all seem to agree on. Of course that includes removing corn-subsidies and levelling the playing field. Big business should NOT be running the government. I agree 100%, a vote is the way to change governments. I do try, and it is my government. With that said you missed my point. Any government can get the science wrong and do things like the Danish tax on saturated fats. That was my only point. Any yes, I think sugar is bad for you other than in very small amounts. You can't let government get away with banning sugar because it is a slippery slope. They'll be after your butter and bacon next. Government interference in nutrition has been going on too long and look where it's gotten us. Right now if you have to rely on the government for food you are forced to eat their way or starve. Prisons, hospitals, schools, day care, nursing homes, etc. Government needs to get out of the way and let people find their own way. I don't need a nanny. Why do people keep phrasing this as "banning sugar"? Is that just to keep the vitriol levels up? You can still drink as much soda as you wish! 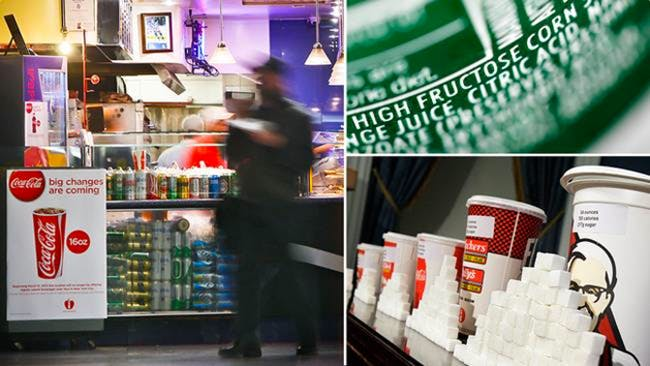 The initiative by Mayor Bloomberg is a common-sense-based cap on soda serving sizes in NYC restaurants... a small step and far from a complete solution but he is acting to try and make change within the bounds of what he can do. Some seem convinced that it will achieve nothing... I disagree and think that it is at least worth a chance. If it fails, it fails... but I (and clearly the soda manufacturers) think that it could well impact soda sales. Others seem to just dismiss it out of hand as an infringement of civil liberties... I don't buy that; as there are plenty of valid examples where public health has trumped civil liberties. OK, overturned, I think I said "scraped" in my post, but not because they thought it was wrong. just not working, My point is lets us get it right and not depend on governments. I like my bacon, and do not want some one to say I can not have it. Thanks FrankG, I think we agree on diet at least, We can agree to disagree on the other things. Thanks Norman... I suspect that many folks commenting here, agree on far more than we disagree. You are probably right that the "fat tax" was dropped for the wrong reasons -- maybe it wasn't bringing in as much money as they expected, or it was just downright unpopular with the voters? -- but sometimes that is what it takes... as Doctor Andreas commented earlier "let's not let the perfect become the enemy of the merely good." Well I'm glad you're all for the appearance of results, rather than actual results. Relying on the government is what got us into this mess in the first place. I do agree there are far too many special interest groups in control. Don't pat Bloomberg on the back just yet, however. The first thing you have to do to get government to "fix" anything is to admit that they were wrong. This has never happened in my recollection. I believe in what Doctor Andreas is doing here and DJ I agree with you are saying and not Doc or FrankG on this subject, but this is not the place to discuss it I think. Distracts form the message that LCHF is good for you. "Well I'm glad you're all for the appearance of results, rather than actual results." Perhaps if you stuck to the stated facts and didn't twist or misrepresent what others are saying to make your point, we might (just might) be able to have a rational discussion on the subject. I am tired of the absolute statements which are so sure that the ONLY thing that will work is this, that or the other while at the same time being absolutely certain that these other (as yet untried) initiatives CANNOT possibly work. Ideas which are untried and untested are not yet at the state of certainty, at least not for me.. we don't know if this idea from Mayor Bloomberg would have any effect but clearly the soda manufacturers are concerned enough to invest multiple millions of dollars to make sure it does not get tried. Why are they worried if others here are so sure it won't make a difference? And have you ever heard of a politician freely admitting they were wrong? Seriously? If they correct the mistake (even while saving face), isn't that enough to be going on with? I agree Norman. I just don't think that more regulation is going to fix our problems... because it's that regulation that CAUSED the problems in the first place. There are better ways to get people to make healthier choices... regulation is NOT one of those ways. So we should rescind the smoking-in-public-places and seat-belt regulations.. rely on education instead? Frank, I'm telling you now, this won't work. Even if it makes a dent in soda consumption, it would be just that... a dent. People that drink soda to excess are still going to do so... just not in the same way as before. People that smoke still smoke, do they not? It's time to man-up and have some personal responsibility for a change. Ask the average person if they believe that soda they're drinking is good for them. What do you think their answer will be? I can virtually guarantee they know it's bad for them, but THEY DO IT ANYWAY. Making laws limiting the sizes of their beverages of choice won't change that in the slightest. This is another fine example of government running amok making all sorts of regulations when they don't even understand (nor care about) the root of the issue. As long as they are pushing low-fat, high-carb nonsense, this will never make a difference. Banning something from on high and then telling the common folk that it's "bad for them" just results in a lot of pissed off people. It's definitely not the way to get people to make healthier choices. You're comparing apples to oranges. Public smoking affects everyone that breathes in the smoke. Soda consumption harms no one but the consumer. Well so long as you are "telling me now" you could have helped out the soda manufacturers to the tune of multiple millions of dollars; which they could have saved by not worrying about this initiative. I'm sure they would be grateful for any help you give them. Soda consumption affects the health of you and your loved ones.. children learn by their parents' example. If you get a chronic disease do you really think that does not impact the health of your family? Health insurance/cost is jacked up as direct result of obesity and other metabolic disorders caused by too much sugar and refined starches AKA soda! If people can't afford health care doesn't that negatively impact their health? THINK! Just because people don't make the choices YOU want them to make, doesn't mean YOU get to force them to make those choices. Let's start banning butter and bacon right now... cause those are full of arterycloggingsaturatedfatTM! Where does it end, Frank? You cannot possibly legislate people into making better choices for themselves... I would think the "war" on drugs would be a clear indication of that. If your unhealthy choices affects your family, then it's up to YOUR FAMILY to persuade you to make healthier choices, not the government. "Health" insurance is based on the same BS as every other government policy concerning nutrition. They will just as likely ban saturated fat as anything else, because it's so "unhealthy". You're still thinking this ban will magically make all these problems disappear. I already know that it won't. Do something worth doing beyond a public relations stunt. I have already detailed several other public health issue where legislation has been necessary and successful in persuading people to make healthier choices. Your world seems black and white with no middle ground for compromise. You talk a big talk "time to man up and take responsibility!" but any further discussion with you is a waste of time. I hear people constantly complain about the erosion of their personal rights in the United States. Things like Homeland Security, unwarranted wiretapping, etc. Now while banning sodas over 16oz... and yes it is a "ban", just not a complete ban... isn't on the same level necessarily; it's just a prime example of people willingly giving up some personal freedom while complaining the government is taking away that personal freedom. Who are you to decide what's good and what's bad for people? Who is Bloomberg to decide? You see this as a great idea... so of course you won't complain when they do something like this. But what if they take away something you don't agree with? What if they told you that you couldn't purchase more than one pound of bacon a month? What if they told you that you could not order a steak over 6 oz? What if they told you butter was bad for you (oh wait...) and decided to limit you to 1/2 pound a week? Would those be good ideas to you? You see, it IS a black and white thing. You either have your personal freedom, or you cede it to the government. It is indeed naive in the extreme to believe that this or any other bright idea by the government will fix anything. It WILL fail... and when it does, you can be sure that arterycloggingsaturatedfatTM will be the next target. Cause when something fails, it doesn't mean the government was wrong, it just means they didn't make it big enough or throw enough money at it. You could say the exact same things about smoking, seat-belts, alcohol, drugs, clean water supply, food safety and inspection etc.. all these require legislative action to keep us safe -- in some cases from our own poor choices but in others to control the predatory practices of those who would seek to take advantage of us. If it IS black and white then either we have a responsible and accountable government watching our backs when it comes to public health, or we don't... which is it to be? A ban on ludicrously over-sized serving sizes is hardly a ban on drinking as much soda as you wish; this has been pointed out many times in these comments. I am NOT trying to force my views on anyone... but if you think that drinking 32 oz of soda at a single sitting makes any kind of common-sense (or throwing it down the drain if you are that wasteful) then fill yer boots pilgrim! IF my "government" tries to control fat (already tried) bacon etc... then I would make my views very clear to my representatives... do you honestly think that your logic is sound - just because I support one initiative by "government" then I will support them all... without question? What?!? How exactly do you expect things like the corn-subsides to be overturned WITHOUT government intervention? We just drop them without due consideration of how better to spend that money? How many farmers would that put out of business? They aren't the ones who benefit from it, they just earn enough to live on... the soda manufacturers are the real winners here.. and YOU are helping them. I am a grown woman, who until recently, has made some horrible choices about what I put in my body. I am a grown woman, who made a choice to not put that garbage in my body any longer. Every other person in the USA has the same CHOICE. I do not require a nanny state telling me what I can and cannot eat, drink, smoke or shoot. I appreciate the new diet and lifestyle that you have helped me find, but I think you are wrong. Pure and simple. And like many other people who read your comment, I am more than a little insulted. It seems a lot of people don't want to have their "government" get involved with any type of regulation. To some degree I can sympathize with that. The EU has A LOT of weird regulations (curvature of cucumbers, size of apples...) which are totally insane and should go away. But I think the regulation of availability of harmful and addictive substances is a must: alcohol, tobacco, certain types of medication - just like it is now. The bare minimum we can expect and demand is that children are actively protected.
! LET'S HAVE FREE DYNAMITE FOR EVERYBODY ! Don't like you neighbor? Throw a few sticks over the fence... Need money? Blow a hole into the next ATM... Of course that is completely absurd, but that goes to show that some things simply shouldn't be available without limits. Bad things are bound to happen. In case of dynamite it's severed limbs or missing heads, in case of sugar it is diabetes and heart disease. Sugar just happens to be one of those things that kill us by the millions. The food industry uses that stuff freely, excessively, without any measure - and the government pumps them full of money via subsidies. We know it, they know it, and it's got to change. You mean the same government that built the food pyramid, subsidizes and promotes the grain industry, lowers fat and increases sugar content in school food, protects the sugar industry from foreign competition, promotes the use of high fructose corn syrup, and tells us to use heart healthy vegetable oils? I'm sorry, but the libertarians are right on this one. There is no doubt that the government has made disastrous mistakes in the past, which have killed millions (including dietary guidelines, various wars and so forth). There is also no doubt that the government has been infiltrated and infested with lobbyists of any kind. Therefore it is also obvious that the government leans towards these groups, which may be called corruption. This behaviour of our representatives is the same across all countries on this planet. However, there is NO good reason why WE cannot force them to do what WE want. Ultimately they want to stay up there, get reelected. It's up to us. WE need to pester them, relentlessly - raise hell - until they give in. There is no way around that. Cut all agri-subsidies and reduce taxes for every day joe, so he has more cash in his pocket? Fine with me. Jobs may be lost during the shift, but the well-being of billions of people is at stake here. We can't feel sorry for businesses that hurt us willingly and don't want to change. We must rot the public image of those companies and politicians, just like their actions or idleness rots our health. They sow the wind and reap the whirlwind. Let's make it a hurricane! Why FORCE anybody to do anything? Why beg the government to give us permission to eat what is right? This notion that lobbyists have corrupted government seems odd to me. People talk as if government would be as pure as the Virgin Mary if only those nasty lobbyists were out of the way. The rent seeking lobbyists and special interests show up precisely b/c the government has the power to provide subsidies, create deadly food pyramids, smother competition, repress speech, mandate diets (to schools and hospitals), and dictate the size of soda cups. Get rid of the ability to do favors, and the greedy lobbyists have to find real jobs. 1) Dr. Eenfeldt still has the freedom of speech. 2) We still (at least for now) have the freedom to decide what food to put in our bodies. We don't need politicians to make the right decisions for us. We need them to get out of the way so that we can make the right decisions for ourselves. Likewise, when the government decided it was going to improve our health with food pyramids and such, we only got fat. Doc has a severe case of compartmentalization. Knows what's good food and good health, but unable to grasp the whole context. Government made people fat by diet advice and subsidies to certain companies. Show me a welfare state government that actually managed to solve any problems. Oh right, never existed. Educate instead of regulate. Otherwise, you'll set precedents that only enable regulations by politically influential anti-LCHF diet people that make it more difficult for us to eat LCHF. Do you want to see a tax on fats? Since when does the Government decide what's good or bad for you! It's our choice and our decision!!! !